Leinster overcame a determined Edinburgh side to claim top spot in the Pro12 and set up a home play-off semi-final against Ulster. Greig Laidlaw successfully kicked a penalty either side of Jordi Murphy's try to give the visitors the lead at the interval. However, Jimmy Gopperth's penalty put Leinster back in front. Gopperth converted after Dave Kearney crossed before Laidlaw added the extras to Tim Visser's try for Edinburgh. The Scottish side finish eighth in Alan Solomons' first season in charge, while Matt O'Connor's side will now turn their focus to winning the play-offs and retaining the Pro12 title. Leinster, who had Sean O'Brien back following shoulder surgery, knew a win would stave off the threat of being usurped by Glasgow Warriors, who won comfortably against Zebre. Edinburgh lost wing Sam Beard to an early knock and, after Laidlaw kicked his first penalty, fine work by the Leinster backs created a gap for Murphy to power through. Gordon D'Arcy and Dave Kearney combined to good effect on the left and Murphy spun out of Dave Denton's challenge to plunge over. Richardt Strauss hobbled off for the hosts and Leinster had a let-off when Carl Bezuidenhout's try was ruled out for a forward pass by Visser. There were further injuries for the visitors as backs Denton and Matt Scott were forced off but Solomons' side showed resolve and Willem Neil held up Leo Cullen and Brian O'Driscoll. And, after O'Brien had infringed at a ruck, Gloucester-bound Laidlaw tapped over to edge Edinburgh ahead. A penalty from Gopperth turned the match back in Leinster's favour after a concerted period of pressure at the start of the second half. And Gopperth's inviting pass sent Dave Kearney darting past two covering defenders to score just to the right of the posts, with the fly-half's conversion putting more distance between the sides. However, Edinburgh responded with a a smart break from Laidlaw, who released Visser for a well-worked try. And Laidlaw marked his final appearance for the Murrayfield side with another two points with the boot. 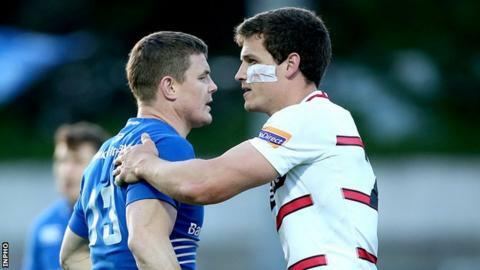 The visitors remained a live threat during the final quarter-hour but Leinster held firm for the win. Leinster: R. Kearney, McFadden, O'Driscoll, D'Arcy, D. Kearney, Gopperth, Boss, J. McGrath, Strauss, Ross, Cullen, McCarthy, O'Brien, Murphy, J. Heaslip. Replacements: Macken for R. Kearney (63), Madigan for D'Arcy (67), L. McGrath for Boss (79), Healy for J. McGrath (54), Cronin for Strauss (13), Moore for Ross (54), Ruddock for Cullen (55), Ryan for O'Brien (56). Edinburgh: Bezuidenhout, Beard, Scott, Strauss, T. Visser, Leonard, Laidlaw, Dickinson, Ford, Nel, Gilchrist, B. Toolis, Coman, Leonardi, Denton. Replacements: Francis for Bezuidenhout (71), Hart for Beard (3), Atiga for Scott (29), A. Toolis for B. Toolis (59), Basilaia for Denton (27). Not Used: Hilterbrand, Blaauw, Berghan.